I have come a long way since taking my first steps outside. On the drive back to Kentucky, those silly people thought they could keep me in a basket in the backseat. I taught them that I belonged in their lap. I was good; I did not bite, and I walked properly on the leash at every rest area, leaving my mark at every stop. I did not complain until we were 15 minutes from home. It was a long drive after all. It was worth it because now I have a food bowl that is all my own. I don’t have to fight with seven brothers and sisters. That silly woman that held me most of the way home, slept on the floor next to me on the first night. I was a little homesick after all. I like my new digs. I sleep in a crate next to their bed. I only wake them up once a night to go potty. The big guy gets up early to go to work, and he takes me out for a walk to take care of my business. We then play for a while. I go to sleep, and let her go see her horse or run errands. I have been to visit the veterinary. They cut my nails and told me that I weigh nine pounds. Of course they said I was perfect in every other way. I have to go back on 2/1 to get shoots. I don’t like the sound of that, but I’ll be brave like I’ve been bred to do. I’ll try to write when I can. They keep having strange people come over to the house, or they take me to places and I pretend to be good. They told me that I have to start going to school in February. I miss you guys, but I like it here. I just wish it would quit raining. 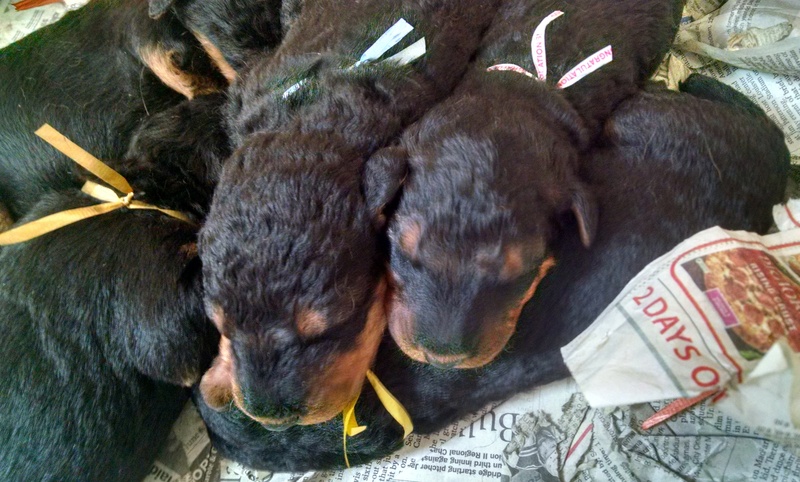 Here We Go Again–The latest news on Seneca Airedales puppies! Here we go — announcing puppies for both Jack and Reddi! 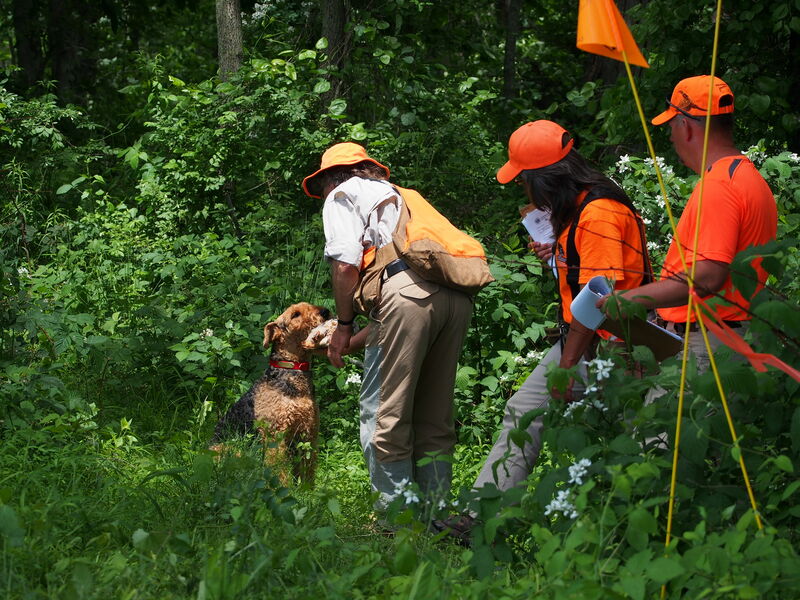 On the left is young Jack, just starting out on his quest to finish the AKC Championship. 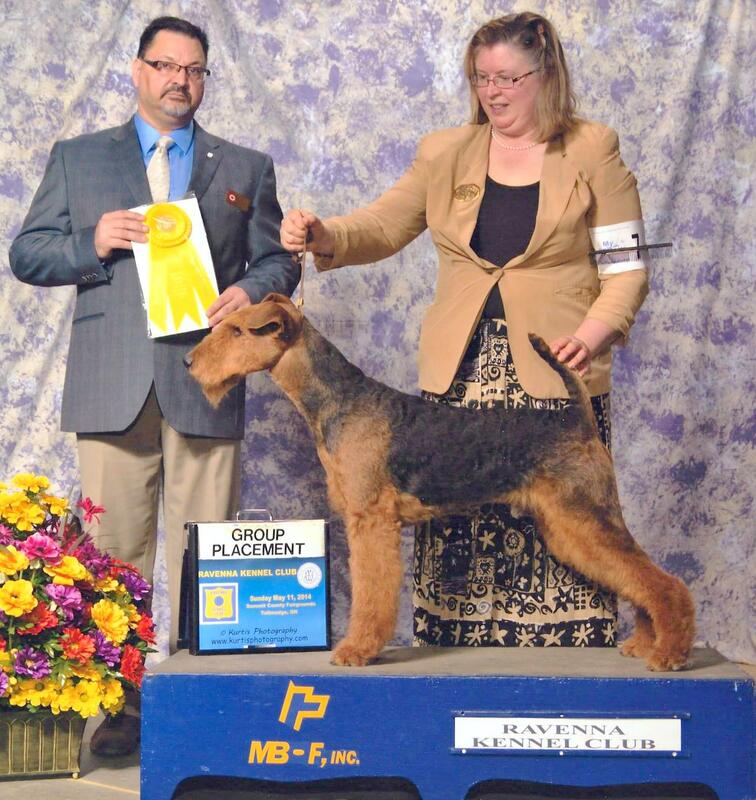 Jack is a son of CH Seneca Minnesota Razzle CDX RE AXP AJP (OFA Good) and out of Ch Seneca You Will Fancy This (OFA Excellent)–Jack is now an AKC Champion and certified OFA Good. Next is Reddi, with the new babies, born January 14th. Reddi is a five year old rated OFA Excellent, sired by Seneca Whodunit’s Case Closed CDX, TD (OFA Good) and out of CH Seneca Texas Sternchen (OFA Excellent). 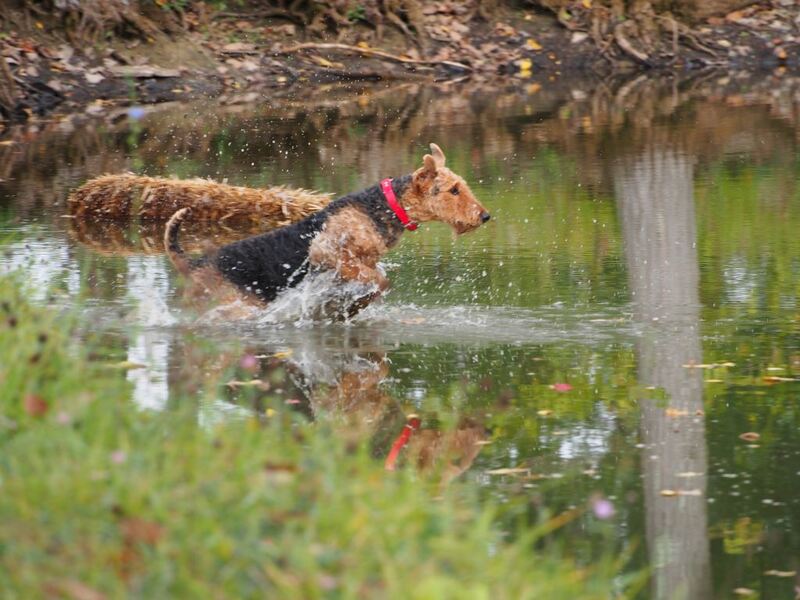 What’s more, Reddi is a sister to the well known SHR Seneca Scarlett von Summit JH JHF JHR SHU MH who has been tearing up the field trials with her high drive bird work! Just last fall of 2016 she earned her Master Hunter (MH)! Congratulations, Ron and Lori! Click on a thumbnail to expand the photos below. Meanwhile, Jack is a littermate brother to Pal, also known as: UKC/HRC SHR (Started Hunting Retrieve) Seneca Have Gun-Will Travel CD, CA (Coursing), JHF (Junior Hunter Upland) OFA Good. Congratulations, Dave Morgan! Here are the nieces and nephews….. Here the little guys and girls are sleeping at just about two days old. A beautiful litter with 6 boys – 3 girls. Getting bigger–Reddi is a devoted mom and very patient. I have to put a leash on her the first few days to come outside with me for potty breaks! Eyes peek open! Three weeks old! Now to start the puppy food…. As you can see….Eating is something these guys take very seriously indeed! Here’s a face that only a mother could love! We’ll need to work on the use of a napkin…. Did we ever mention that puppies go through LOTS of newspaper? We are happy to accept donations of clean full size papers. Slick ad circulars should be sorted out and put in recycling.